Originality doesn’t blast through the cinematic vaults often from an industry oversaturated with remakes, reboots and the like, but director Dan Bush has broken free from the mould with his horror/heist hybrid, a combination of these two worlds stands up well on paper but slightly misses the boat, in reality, dipping in and out of scenarios that are all too familiar. Violence and brutality open the film as a gang of career criminals burst into the foreboding bank lead by sisters Leah (Francesca Eastwood) and Vee (Taryn Manning) hell bent on grabbing as much money as they can for their brother Michael (Scott Haze) to solve his money issues, but this is one family reunion in which it could all end in tears. 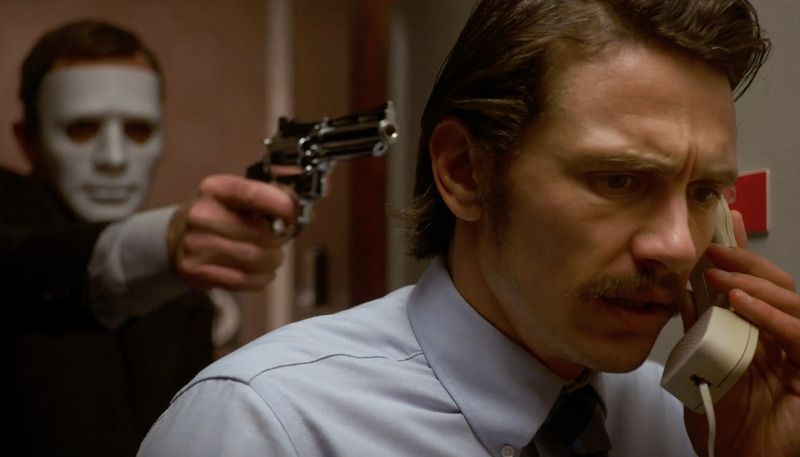 On discovering the vault has nowhere near as much money as they expected, tensions between the robbers become strained and nerves start to fray until the oddly out of place assistant bank manager Ed Maas (James Franco) points them in the right direction to the secret vault downstairs. We soon start to realise that something sinister lurks in the dark gloomy corridors of the basement as one by one those who are sent to break into the vault are picked off in the most gruesome fashion and the sisters have to make a decision in which direction their fate lays. Clearly Bush has taken inspiration from The Purge and Friday the 13th absorbing physical features into his own picture. Whilst expertly building on the tension surrounding the entire heist and its fall out as things start to take a turn for the worse, he fails to capitalise on the thrill seeking scares from his supernatural guests. Drip feeding the audience snippets of information on the legacy behind the haunting adds layers to the intriguing plot line only to be cancelled out by moments of tedious and laborious dialogue. James Franco may be the poster boy to appeal to a wider audience, but his role is by no means at the forefront of the story, something just doesn’t sit right with his character, niggling away at the back of your brain, not quite being able to put your finger on it. The standouts come from our feuding leading ladies, like chalk and cheese Eastwood and Manning command the screen and the male gang members, ruthless yet compassionate these ladies set the rest of the cast in the shade. Deficient of effort and coherency at times, there is still something quite compelling in this tale which takes a tiny twist, there are thrills, there are spills (of blood), even glimpses of action thrown in for good measure but if you’re hoping for something completely new you’re in for a big disappointment as this hybrid stinks of regurgitated supernatural blood lust. The Vault is in cinemas September 8th. Next Post Film Review: mother!